The superyacht program for next year’s America’s Cup has been revealed and promises owners a “premium place in the oldest competition for the oldest trophy in international sport”. Visiting yachts on the America's Cup Superyacht Program will enjoy premium berthing, exclusive ringside seats and access to Club AC (the official hospitality venue). The package also includes a 24-hour concierge service, access to press conferences, pit lane tours and admission to the prize giving. BWA Yachting will be partnering the America’s Cup Event Authority and the Bermuda Tourism Authority to deliver the package. BWA’s Stefano Tositti said the program will offer “unprecedented on and off the water access”. 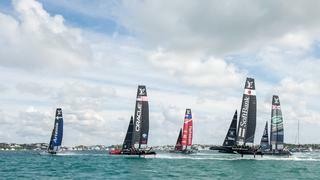 Designated America’s Cup berths will be available at the America’s Cup Marina at Royal Naval Dockyard, the America’s Cup Marina, Front Street and the Hamilton Princes Marina. The Hamilton Princess & Beach Club has nearly completed a $100 million restoration in preparation for the America’s Cup. The largest berth available is 120 metres and more than half of the berths have already been booked for next year’s event. Organisers are confident that the new exciting race format featuring “the fastest boats in the world with the best athletes” will create an unforgettable spectacle. Bermuda is hoping to use the America’s Cup to reinvent itself as a “new, adventuresome” destination with a nautical angle. The Bermudan government has passed a bill making it easier for superyachts to visit over a three-month period around the America’s Cup. It will also be possible for superyachts to charter in Bermudan waters during this period.